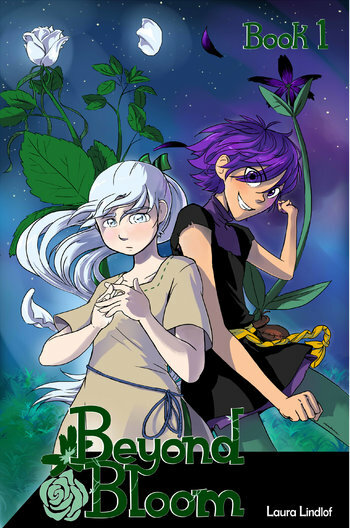 Beyond Bloom is a fantasy Web Comic/Graphic Novel that is heavily influenced by Manga. It's mostly lighthearted and contains elements of action, comedy, romance and drama. Two humanoid flowers, Sikue and Tatsuma, wander aimlessly in their rural homeland, Jaddo, until one day after they had "accidentally" broken into someone's home. The chain of events that follow lead to new friendships and new mysteries. The Quiet One: Sikue often lets others do the talking. This isn't as prominent when she's alone with Tatsuma or sees the need to step in . Good Is Not Nice: Tatsuma is sometimes childishly cruel or a bully to even her own friends. Like Reality Unless Noted: The setting takes place on a completely fictional island, while it is still implied that the real continents still exist outside of Jaddo. Neither of the protagonists understand how anything supernatural came to be, as the world is said to be "without magic". Only One Name: The main characters, without a traditional birth, were given no surname. Sibling Yin-Yang: Sikue and Tatsuma are polar opposites in many ways, one being loud and aggressive, while the other is quiet and gentle. Lady Looks Like a Dude: Tatsuma has this problem both in story and out of story. It is said by word of god that this gag was added into the story because of so many people mistaking her for a male while the author was drawing her. Emotional Maturity Is Physical Maturity: Although Sikue claims that "their lives have not been long" (at least 1 year), she and Tatsuma are fluent in speaking and show a level of maturity that can match their teenage outer appearance. This trope is somewhat subverted when the girls are shown to act more like children , have a lack of awareness of what is socially acceptable, and are generally naïve. Giving Up on Logic: Yokiro, after witnessing supernatural shenanigans, happily accepts that he is either dreaming or going crazy. He is hardly phased by the second encounter. Naïve Newcomer: Yokiro, although Sikue and Tatsuma also display many of these Naïve traits.